Although the current laparoscopic experience is limited to one case, several important points are necessary during laparoscopic as well as open surgery. Reflection of the ipsilateral colon is the first step in the procedure. This allows exposure of the healthy proximal ureter or renal pelvis in order to estimate the required length of ileum. Ureterectomy is necessary only in cases where a ureteric tumor is diagnosed. A suitable portion of ileum is chosen of sufficient length to span the length of ureteric defect, and of adequate mobility to reach the renal pelvis as well as the urinary bladder. Bowel continuity is restored after isolating the ileal segment. The ileal segment is placed in an isoperistaltic direction to avoid functional obstruction. The open end of the ileal segment can be anastomosed to a dilated renal pelvis, to a small renal pelvis opened with an extended pyelotomy into the lower calyx, or even to a dilated lower pole calyx as an ileocalycostomy (11). No tapering of the ileum is needed before reimplantation into the bladder, and no antireflux is needed in most cases. 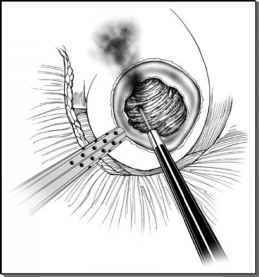 The urologic literature contains only one description of a laparoscopic ileal ureter replacement (12). The indication for surgery was an upper ureteric tumor in a solitary kidney. The basics of the technique described are the same as the open procedure with certain modifications necessary for the laparoscopic procedure. pulling the ileum to the skin surface through a port site. The bowel and the excluded loop were then returned into the abdominal cavity for the ureteroileal and ileovesical anastomosis. With increasing experience in laparoscopic bowel surgery, a completely intracorpo-real ileal exclusion and anastomosis can be performed using the endoscopic GIA stapler with similar results. Freehand intracorporeal suturing was used for both ileal anastomoses in this case described in the literature. As experience with a wide variety of laparoscopic procedures has shown, moving parts of the bowel or the urinary tract from one region of the abdomen to the other and through or underneath bowel mesentery can be particularly challenging. Ideally, an ileal ureter should pass through the sigmoid mesentery to lie retroperitoneally on the left side although on the right side it can be placed caudal to the cecum. In the previously mentioned case, the ileum was placed anterior to the colon (due to scarring from previous surgery) without any apparent ill effects; and with increased experience with this procedure, it will remain to be seen how the placement of the ileum will be performed and how that would affect the surgical outcome. The operative time reported for this case was eight hours, which is longer than the expected time for open surgery, but the authors correctly point to several factors that could reduce operating time. In this particular case some time was lost mobilizing adhesions from previous surgery. Additional time was lost shortening the excluded ileal segment to the required length laparoscopically as well as placing a double-J stent cystoscopically. They recommend precise measurement of the ileal length and placement of the stent through the ileum before performing the proximal and distal anastomoses as a method to decrease operative time. Follow up in this case was three months at which time the patient was doing well with normal kidney function and without urinary obstruction.